Barnard b (or GJ 699 b) is a recently discovered Super-Earth planet orbiting Barnard's Star, making it the second nearest star system to the Earth. Although likely cold (-170 degrees centigrade), it could still have the potential to harbor primitive life if it has a large, hot iron/nickel core and enhanced geothermal activity. That was a conclusion announced by Villanova University Astrophysicists Edward Guinan and Scott Engle at a January 10 press conference held at the 233rd meeting of the American Astronomy Society (AAS) in Seattle, WA. The announcement was based on findings from a paper titled, "X-Ray, UV, Optical Irradiances and Age of Barnard's Star's New Super Earth Planet – 'Can Life Find a Way' on such a Cold Planet? ", co-authored by Guinan, Scott Engle and Ignasi Ribas, Director of the Institute of Space Studies of Catalonia (IEEC), and Institute of Space Sciences (ICE, CSIC). "Geothermal heating could support "life zones" under its surface, akin to subsurface lakes found in Antarctica," Guinan said. "We note that the surface temperature on Jupiter's icy moon Europa is similar to Barnard b but, because of tidal heating, Europa probably has liquid oceans under its icy surface." 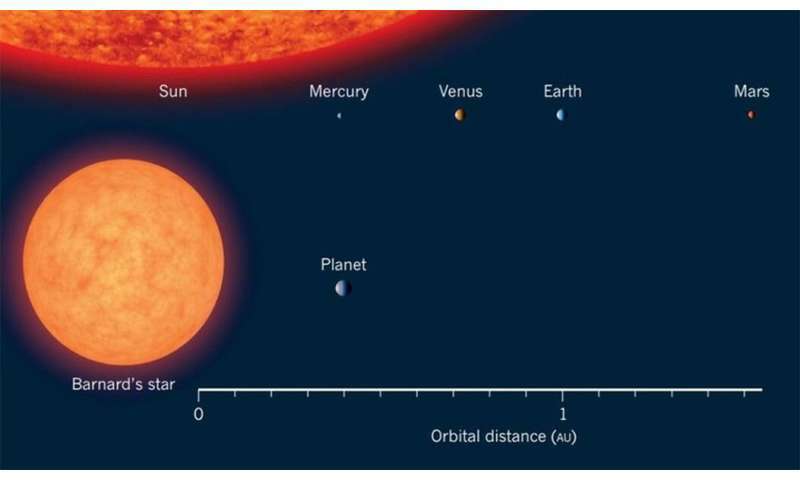 The discovery of Barnard's Star b was announced in November 2018 in the academic journal Nature. An international team of researchers led by Ribas of the Institute of Space Studies of Catalonia (IEEC), and Institute of Space Sciences (ICE, CSIC), which included Guinan and Engle, based its analysis on 18 years of observations combined with newly acquired data. Barnard's Star b, with a mass just over three times that of the Earth, orbits Barnard's Star, a red dwarf star, every 233 days and at roughly the same distance that Mercury orbits the Sun. It passes near the dim star's snow line. Guinan and Engle have obtained high-precision photometry of Barnard's Star (as well as dozens of other stars) for the past 15 years. This data, along with that of other observers, was included in a recent comprehensive study led by Borja Toledo-Padrón, a doctoral student at the Institute of Astrophysics of the Canary Islands, University of La Laguna. Although very faint, it may be possible for Barnard b to be imaged by future very large telescopes, according to Guinan. "Such observations will shed light on the nature of the planet's atmosphere, surface, and potential habitability," he added. "Barnard's Star has been on our radar for a long time," Guinan said. "In 2003 it became a founding star member of the Villanova 'Living with a Red Dwarf' program that has been sponsored by the National Science Foundation/National Aeronautical and Space Administration (NASA). "The most significant aspect of the discovery of Barnard's star b is that the two nearest star systems to the Sun are now known to host planets. This supports previous studies based on Kepler Mission data, inferring that planets can be very common throughout the galaxy, even numbering in the tens of billions," Engle noted. "Also, Barnard's Star is about twice as old as the Sun – about 9 billion years old compared to 4.6 billion years for the Sun. The universe has been producing Earth-size planets far longer than we, or even the Sun itself, have existed."